The Budget 2018-19 made a mention that certain duties on some medical devices have been reduced to nil from 2.5% to correct inversion in the rate of duty. Also, some taxpayers have confusions due to issues in various GST provisions which need attention and one of them is refund of accumulated credit in case of inverted duty/tax structure. With this, one must understand the meaning and relevance of Inverted duty structure. In the pre-GST regime, a situation of Inverted duty structure arose in cases where import duty on raw materials that were used in the production of finished goods was higher than the import duty on finished goods. The term ‘Inverted Tax Structure’ refers to a situation where the rate of tax on inputs purchased (i.e.GST Rate paid on inputs received) is more than the rate of tax (i.e. GST Rate Payable on outward supplies) on outward supplies. A registered person may claim a refund of unutilized ITC on account of Inverted Duty Structure at the end of any tax period where the credit has accumulated on account of rate of tax on inputs being higher than the rate of tax on output supplies. Output supplies are nil rated or fully exempt supplies except supplies of goods or services or both as may be notified by the Government on the recommendations of the Council. If the goods exported out of India are subject to export duty. If supplier claims refund of output tax paid under IGST Act. If the supplier avails duty drawback or refund of IGST on such supplies. Tax period: A tax period is a period for which return is required to be furnished. Example: Supply of Fabric Bags (Output). Value: Rs.1400. GST on the above: 1400×5%= Rs.70. Purchase Value of Non woven fabric Rs.1000. GST on the above: 1000×12%=Rs.120. The value of inverted supply of goods made during the relevant period without payment of tax under bond or letter of undertaking. Net ITC shall mean input tax credit availed on inputs during the relevant period other than the input tax credit availed for which refund is claimed under sub-rules (4A) or (4B) or both. “Adjusted Total turnover” means the turnover in a State or a Union territory, as defined under sub-section (112) of section 2, excluding the value of exempt supplies other than zero-rated supplies and the turnover of supplies in respect of which refund is claimed under sub-rules (4A) or (4B) or both, if any, during the relevant period. “Turnover in State” or “turnover in Union territory” means the aggregate value of all taxable supplies (excluding the value of inward supplies on which tax is payable by a person on reverse charge basis) and exempt supplies made within a State or Union territory by a taxable person, exports of goods or services or both and inter-State supplies of goods or services or both made from the State or Union territory by the said taxable person but excludes central tax, State tax, Union territory tax, integrated tax and cess. The tax amount payable on such inverted rated supply of goods under the same head i.e. IGST, CGST, SGST. The period for which the claim has been filed. GSTR 1 and GSTR-3B has to be filed for the relevant tax period for which you want to file refund application of the accumulated ITC. NOTE: RFD-01A is similar to RFD-01 which is introduced as a temporary solution for application till such time the online facility is enabled for claims of refund. RFD-01A has to be filed within 2 years from the end of financial year in which such claim for refund arises. Fill and file RFD-01A on GST Portal. 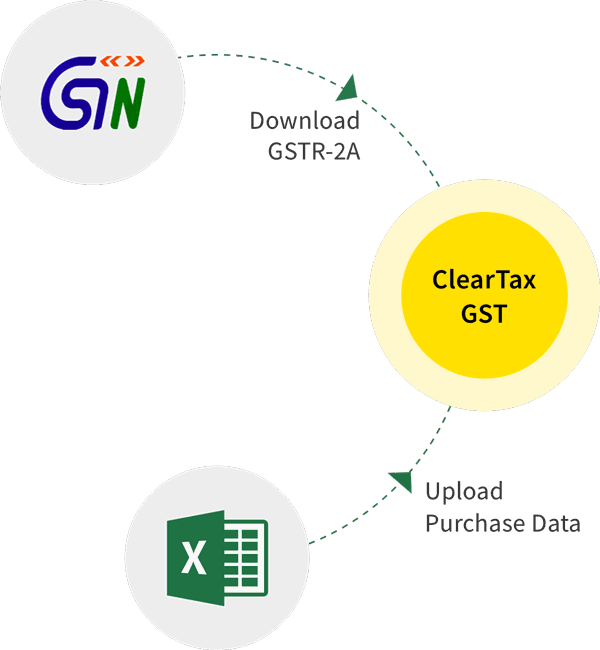 ARN will be generated by the GST Portal. Print the filed application and the Refund application ARN Receipt generated available on the portal. Submit the printed documents with relevant supporting documentation to the jurisdictional authority. Tax official will process the Refund Application. Once the application is processed, refund will be disbursed manually. Contact the Nodal officer of the corresponding state/ center in case where the jurisdictional authority of state/ center is not yet allotted. Download PDFs of the Filed applications (ARNs) using the My Saved / Submitted Applications option under Refunds. Track the status of the Filed applications using the Track Application Status option under Refunds. A manufacturing industry may have multiple number of inputs with variable tax rates. Some having lower rate than output, some having the same rate as output, some in the nature of inverted duty structure. In this case, it is very difficult to correlate the output with inputs. Hence this results in inaccurate computation of refund amount. Even though, services was brought into the purview of computation of maximum amount of refund, “input” means any goods other than capital goods used or intended to be used by a supplier in the course or furtherance of business. Here, the definition of “input” does not include input services. Hence, refund of ITC on input services is not available. Also, refund of ITC on capital goods is also not available. Whether the refund of accumulated credit on account of inverted duty structure is available only for those inputs where the rate of GST is higher than the outward supplies or for all inputs? From the above, it is important to note that it does not specifically mention inputs having higher GST rate than output supplies. Therefore, for the purpose of calculating refund claim on account of inverted duty structure, entire credit of inputs can be considered.